Traveling cat spotted in Mex, a cozy mountain village in the Valais canton of Switzerland. Since 2013, Mex is part of the municipality of Saint-Maurice. 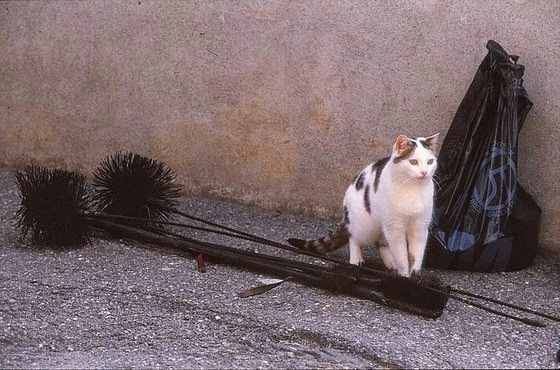 Must be a chimney sweep cat, judging from those brushes and the sooty spots on his back! ]ღ husky hugz ღ frum our pack at Love is being owned by a husky! Oh my real life chimney sweeping stuff just need to find the sweep for luck. Have a terrific Tuesday. That sure is a sweet looking one! Attention à ne pas se salir. Now I am wondering if this cat is actually white but the chimney sweep got to him. Going to vote for you right now. So adorable! He looks like a cookie. Looks like he's about to sweep the chimney! Pretty kitty! I'd be watching that garbage bag tho...she looks ready to tear into it. I'm curious about the bag behind the cat--looks like he's been shopping! Un joli pelage tacheté pour ce chat ! I love your cat photos! !